Google Analytics is one powerful Analytics software that is currently being used by thousands of webmasters (if not more) around the globe. If you are a webmaster, you know that putting up a website and writing content is not the only thing you have to worry about to take your venture to the next level. You are going to have to track your visitors and listen to them to find out any clues you can to help you optimize your website and take it to the next level. Google Analytics is just the software kit that lets you do that and more. Thanks to Analytics HD, you can now play with Google Analytics and go over your reports on your iPad. So your numbers are never going to be too far away as long as you have access to the Internet. Checking Google Analytics on iPhone is fun, but it’s nowhere near as fun as trying it on the iPad. 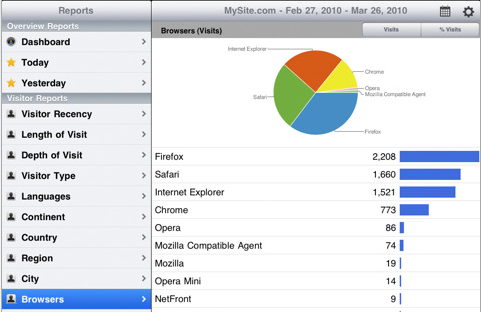 If you want to go through your site’s stats and dig up some real information from your reports, the iPad’s large screen makes it very easy. Analytics HD comes with 55 reports and shows up to 100 rows of data. It also gives you access to full screen charts and multiple metrics per report. Analytics HD also supports multiple logins and accounts. So if you have a ton of websites and have gone over your accounts’ limits, you can easily switch among your accounts on your iPad. This app comes with handy “Today” and “Yesterday” reports, so you can get a glimpse of the latest information about your website even when you don’t have time to delve into your data. I found the interface to be very intuitive and the reports to be more than handy. You almost don’t realize that you are checking your analytics reports on a handheld device. The large screen does make a difference, but you have to give credit to the makers of this app as the app’s look and feel are easy on the eye. 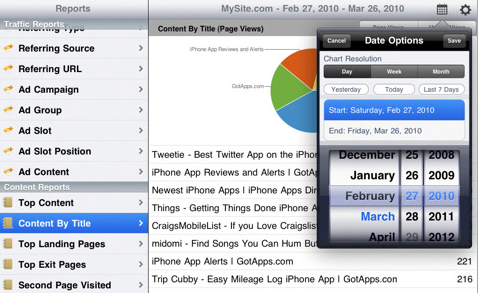 If you use Google Analytics to keep track of your site’s traffic and stats, Analytics HD is a very useful app to own.